Three friends make a startling discovery underground. They then find that their encounter has left them with amazing, superhuman powers. What begins as adventurous fun soon turns sour as their powers take a disastrous turn for the dark side. I really loved Chronicle. I didn't know much about this film when I first watched it and it was, therefore, such a pleasant surprise. Shot in a found footage style that has started to irritate, the format didn't actually grate with me at all in Chronicle. It seemed only natural that the three friends would want to record their burgeoning super powers. The boys also reacted to their new talents in a very natural way - they had fun and used them to impress their peers. What elevates Chronicle is the character of Andrew (Dane DeHaan). Andrew is an extremely troubled and disaffected young man whose powers in combination with his anger and frustration at the world make for a very dangerous combination. Chronicle's effective and powerful storytelling leads us to the dark side of this tale by making us care for and understand the rage within Andrew. However, for me at least, the film goes a step too far in its extreme ending. I would have far preferred something a little more poignant and understated. However, this is only a slight niggle - overall I thoroughly enjoyed re-watching Chronicle and would happily watch it again. 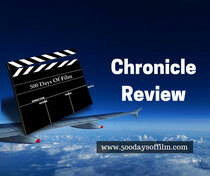 Have you watched Chronicle? I'd love to know what you thought of this movie. Do you agree with me about the ending?